Textile with Built-In LEDs #WearableWednesday « Adafruit Industries – Makers, hackers, artists, designers and engineers! 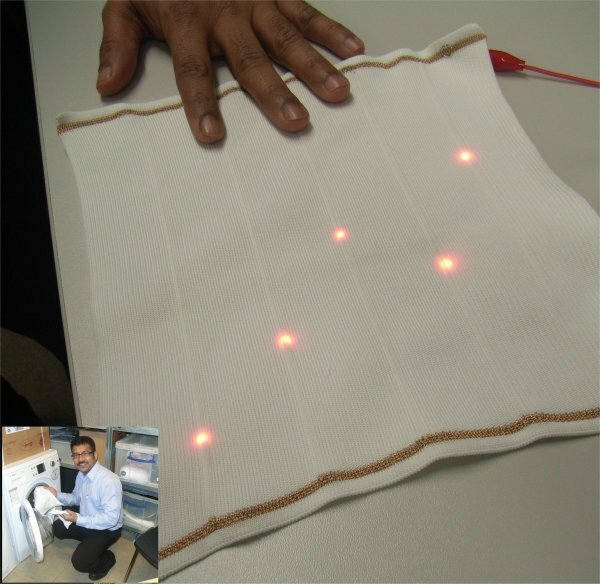 Although we know you can stitch Neopixels on fabric and still have wash and wear, according to Advanced Textiles at NTU, this fabric embedded with LEDs proved washable. The picture shows that the electronic textile produced by Anura Rathnayake continues to function after repeated machine washes. Anura uses light emitting diodes to act as a demonstrator but the inclusion of other semi-conductor chips is certain to lead to a host of new wearable technologies. Applications include body monitoring in medicine and sports, the full integration of RFID chips into textile products and, in the long term, the integration of communication devices and more sophisticated electronic systems.